This refrigerator repair guide will walk you through many common problems with refrigerators On the next few pages you will find information that will guide you on repairing refrigerators and icemakers. If you want to know how to repair a refrigerator you’ve come to the right website. Refrigerator repair is generally the same no matter if you have a GE refrigerator, Hotpoint refrigerator, Whirlpool refrigerator; they’re all pretty much the same. Things like location of parts such as defrost control or cold control vary with every model, but the procedure for repair is pretty consistent throughout most brands. This is not to say that the parts are interchangeable, you must still order parts for your specific model. The most important thing to know when repairing a refrigerator is the exact problem it has. Below is a list of links that describe common problems that refrigerators have. First, and this is very important, check your refrigerator and find its exact problem and then click on the link that best describes its problem. If you chose the wrong one it will lead you in the wrong path and you will be checking parts unnecessarily. However, don’t worry if you chose the wrong one you can always come back and start over. These are links to pages that help with refrigerator temperature issues. For GE’s electronic refrigerator made after 2002. Including top-freezers, bottom-freezers, and side-by-side models. As stated above, refrigerator repair is generally the same no matter if you have a GE refrigerator, Hotpoint refrigerator, Whirlpool refrigerator; they’re all pretty much the same. But GE came out with the new side-by-side refrigerator in 2002 and it was very unique. Although the basic refrigerator concept was still in tact, the operating characteristics were very different from what I was use to. Adaptive defrost was one of the changes they made. Adaptive defrost adjusts the time between defrost cycles according to how many times your family opens the door and how long the door is opened. 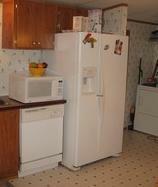 Before, refrigerators just had a mechanical timer that would turn on the defrost cycle at a set time. Another major change was that these refrigerators use a main control board to control every thing. They also started using thermistors rather than cold controls. Along with these changes came a few unique problems, which is why I have written separate articles about GE side-by-side refrigerators made after 2002. The following are refrigerator repair pages for GE side-by-side refrigerators with the dual evaporator system.